When I was younger, I define success as achieving fame, wealth and power. Now that I'm a little wiser, I realize that success is subjective. There is no all-inclusive meaning of success. It is relative to what one sets as goals and not a "one size fits all" definition. Whine success maybe achieving financial freedom for some, it maybe as simple as celebrating small victories and good health to others. Success may come easy for those born to wealthy parents. On the other hand, it may evolved through years of hard work, learning and practice. The road to success for most people looks uncertain replete with unexpected surprises. 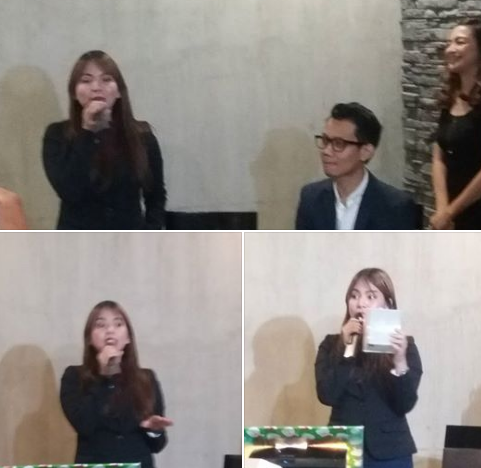 Kristine Marcelo, CEO of IEF Inc. shared that there are certain circumstances that sometimes hinder your road to success. As the organizer of the upcoming symposium dubbed as “Success: Ignite – Empower – Fluorish”, IEF will help participants gain success and be better versions of themselves. 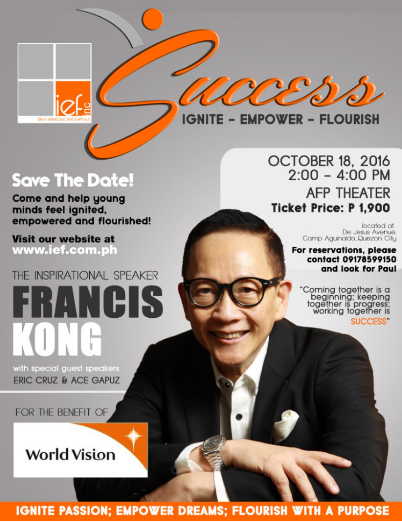 IEF is on a mission to empower more people as they present presents IEF SUCCESS: Ignite – Empower – Fluorish on October 18, 2016 (2-4PM) at the Armed Forces of the Philippines (AFP) Theater located at De Jesus Avenue inside Camp General Emilio Aguinaldo, Quezon City. 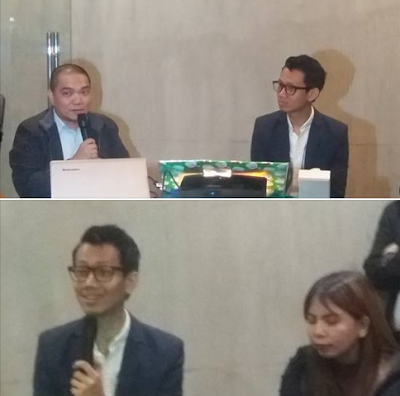 The said symposium features Francis Kong, Eric Cruz and Ace Gapuz. Part of proceeds will be for the benefit of World Vision. Kristine and other guests speakers will share how they overcame obstacles in reaching their individual goals in spite of the many things that stood their way. Francis Kong (The Outstanding Filipino TOFIL award winner 2014) and these remarkable people have gone through success issues and found the key to ignite inner strength that enabled them to succeed in life and career. Be inspired and learn the secrets to success by attending the Francis King speaking engagement. IEF will help you stay focused on your personal goals and keep things in perspective. A ticket costs P 1,900. Contact Paul 0917 859 91 50 for ticket reservations.